We have delivered the most powerful and reliable, truly full-spectrum (365-750nm, UV to NIR) LED plant grow lights! The new custom housing is designed to better distribute light and dissipate heat, and the. 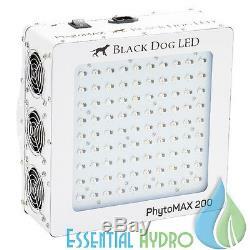 Uses the highest-quality, latest-technology, top-bin LEDs to deliver Black Dog LED's proprietary full-cycle Phyto-Genesis Spectrum. Replaces 300 Watts of HID (HPS/MH). Producing a superior yield with higher quality flowers. Saves on electrical, cooling, reflector and bulb replacement costs. High light intensity crucial for canopy penetration. Even coverage eliminates leaf burn and hot spots. 215 True Watts - 450 LED Watts. Will outperform any other equal-wattage LED grow light on the market! Largest Proven Footprint of any LED Grow Light. Research-proven, large, evenly covered footprint (no hot spots). Proven by independent spectroradiometer testing. New and Improved Cooling System. The best active heat management in the industry, crucial to maximizing LED life and spectrum stability. The most efficient spectrum for growing plants, based on over 5 years of research and testing, outperforming HPS, MH, CMH (LEC), induction, fluorescent, and "white" LEDs in equal wattage tests. One ideal spectrum for both vegetative and flowering stages eliminates growth stalling associated with spectrum changes such as switching from MH to HPS. True full spectrum ranging from UVA to NIR (365-750nm) goes Beyond PAR for ultimate flowering and vegetative plant cycles. Targets not only photosynthetic (chlorophyll / carotenoid) peaks but also. Increases THC, CBD, terpenes, flavonoids, antioxidants / vitamins and pigmentation with UV light. Includes near infrared (NIR) light to boost photosynthetic efficiency through the Emerson Effect. Largest heat sink in the industry for superior cooling and increased LED life. With a 6-12 month average return on investment. Is the best value per watt of any commercial LED grow light. Contains no Highly Toxic Mercury. Unlike all HID (HPS, MH, CMH / LEC) and fluorescent / induction bulbs. Metal adjustable ratcheting 6-foot light hangers. Once you grow with a. You'll understand why people say HID is a thing of the past! 3.5 feet (107 cm). 2.5 feet (76 cm). Hanging height above average top of plant canopy to achieve the maximum recommended footprint size. For more in-depth information on. 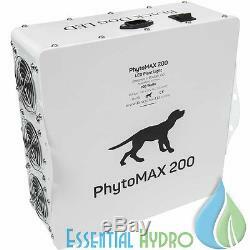 PHYTOMAX 200 LED GROW LIGHTS SPECIFICATIONS. 2.5' x 2.5. 3.5' x 3.5. 18" x 18" x 10. 12" x 12" x 5. FCC and CE certified and ROHS compliant The lights operate internally on a D/C current and as such are able to accept a range of input voltage and auto adjust the current for safe operation. 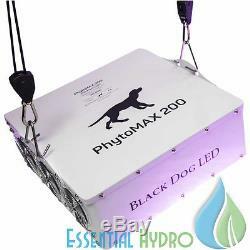 The item "Black Dog LED PhytoMAX 200" is in sale since Monday, May 09, 2016. This item is in the category "Home & Garden\Yard, Garden & Outdoor Living\Gardening Supplies\Hydroponics & Seed Starting\Grow Light Kits". 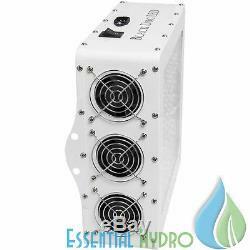 The seller is "essentialhydro" and is located in San Francisco, California. This item can be shipped to United States, Canada, United Kingdom, Denmark, Romania, Slovakia, Bulgaria, Czech republic, Finland, Hungary, Latvia, Lithuania, Malta, Estonia, Australia, Greece, Portugal, Cyprus, Slovenia, Japan, China, Sweden, South Korea, Indonesia, Taiwan, South africa, Thailand, Belgium, France, Hong Kong, Ireland, Netherlands, Poland, Spain, Italy, Germany, Austria, Russian federation, Israel, Mexico, New Zealand, Singapore, Switzerland, Norway, Saudi arabia, Ukraine, United arab emirates, Qatar, Kuwait, Bahrain, Croatia, Malaysia, Brazil, Chile, Colombia, Costa rica, Panama, Trinidad and tobago, Guatemala, Honduras, Jamaica.